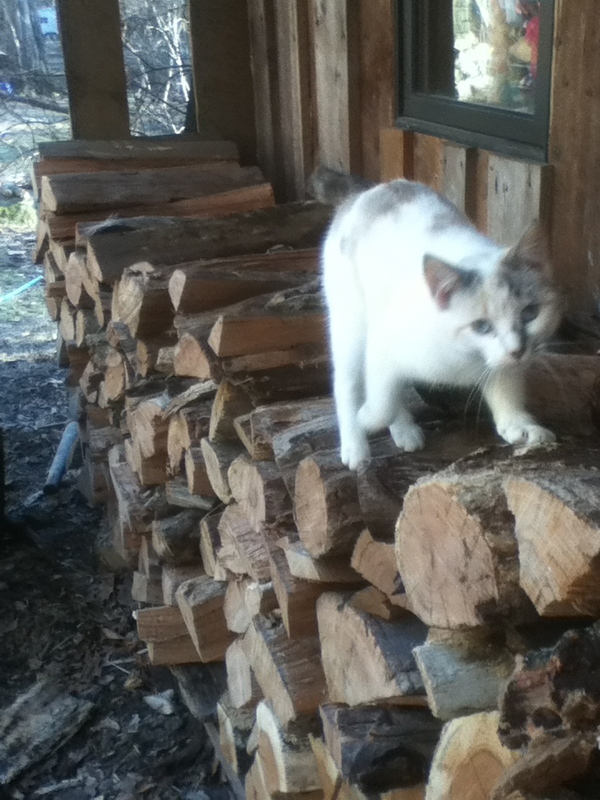 After the last cold snap, our woodpile looked a little meager. We’ve got stacks of wood all over the place, but our good seasoned stuff is now a pile of ashes in the ash barrel. Coincidently, a very dead and very giant tree fell onto one of our pasture fences on the far side of the farm. And it was red oak. That’s like gold to those of us that heat our houses solely with wood. 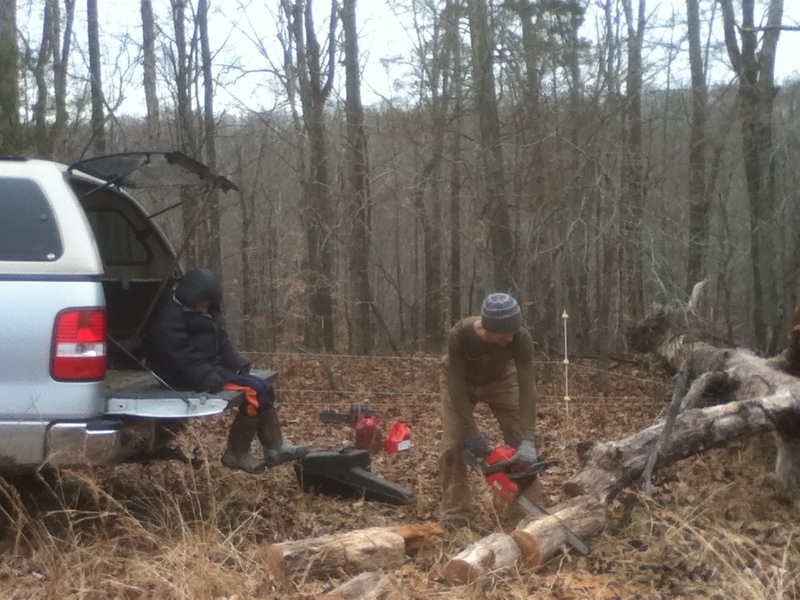 So the whole family bundled up and loaded up into the truck for some family firewood fetching. The first phase of warmth that comes with burning wood: the gathering. 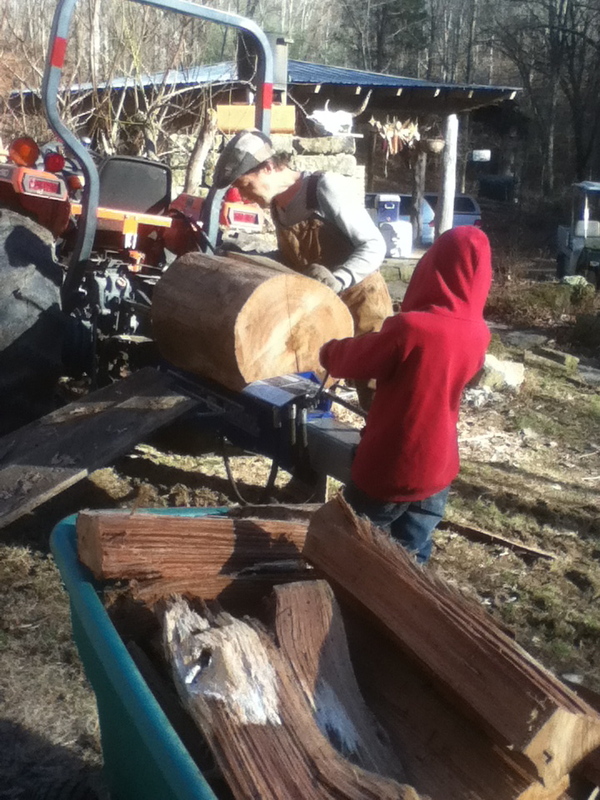 Eric is the chainsaw wielder of the family (I’ll admit that chainsaws have always intimidated me) so once he had the smaller stuff cut up into manageable pieces, the kids and I started loading the truck (heavy lifting on the other hand is something I am not intimidated by). Eric and I are a good team that way. We always have loved working together and do a pretty good job of complimenting each other’s strengths and respecting each other’s weaknesses. And now the kids are getting big enough to really be helpful so the work crew is growing! It’s so much fun to have the whole family on a project together, too! 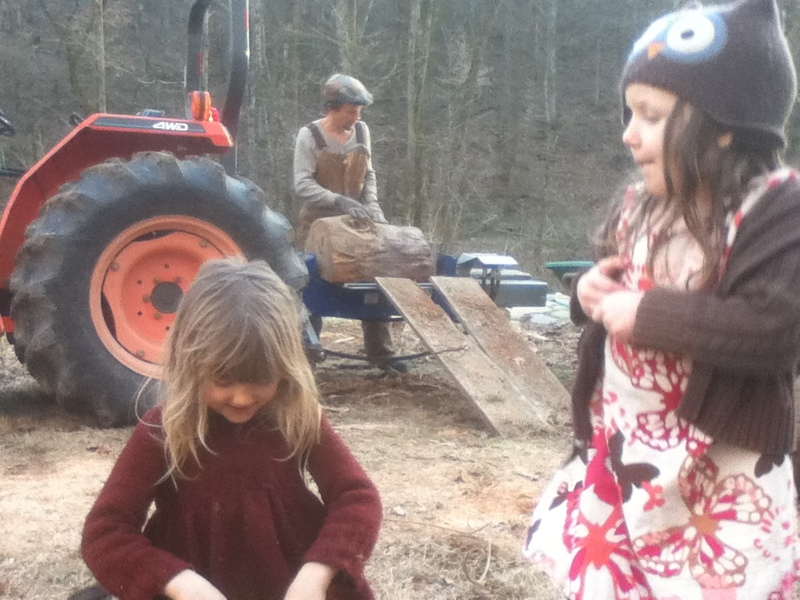 Ira and Opal, mesmerized by the chain saw. 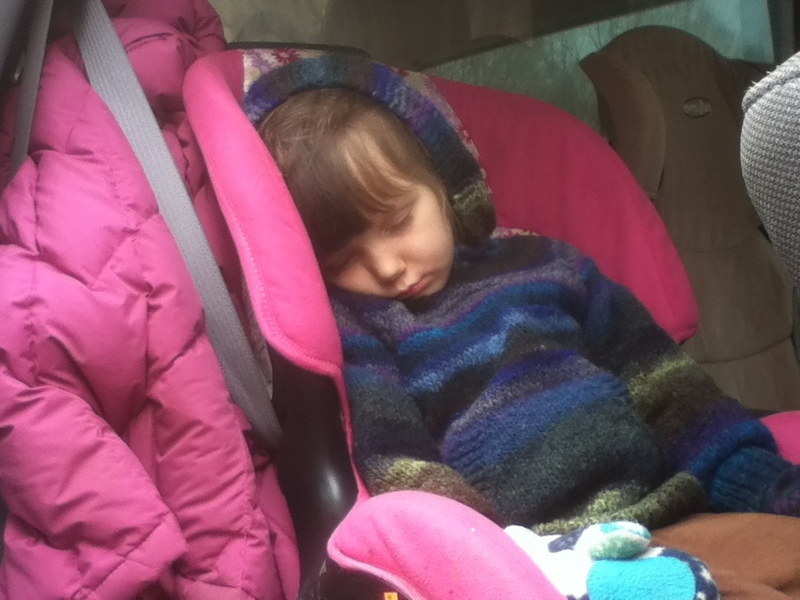 The snail’s pace four-wheel drive bumping and bumbling to the far ridge of the farm lulled this little helper into a deep sleep. Ah, well… she’s the baby of the family. She can still get away with such things. 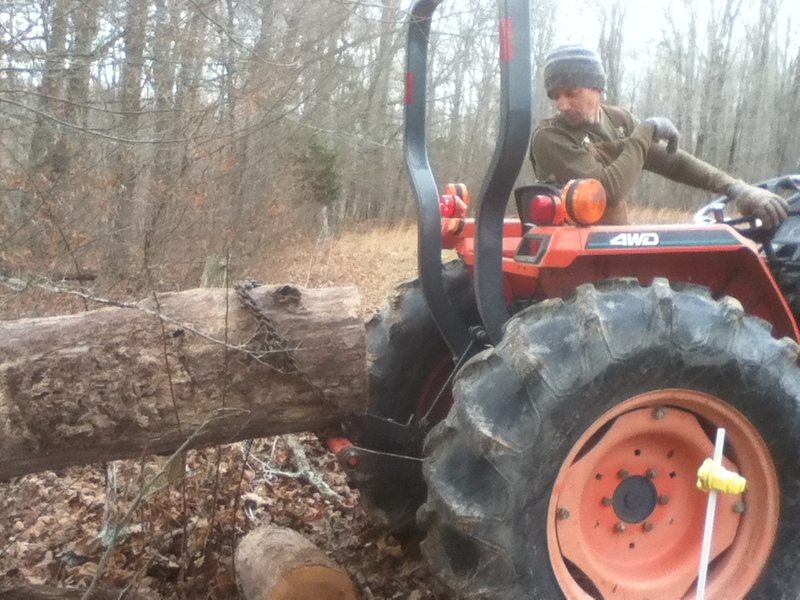 Once the truck was loaded, we then chained the big base log to the tractor and dragged it down to the homestead for sawing and splitting… you know, right next to the woodpile so we could handle the wood one less time. We do try to be efficient around here. The second phase of warmth that comes with burning firewood: the splitting. 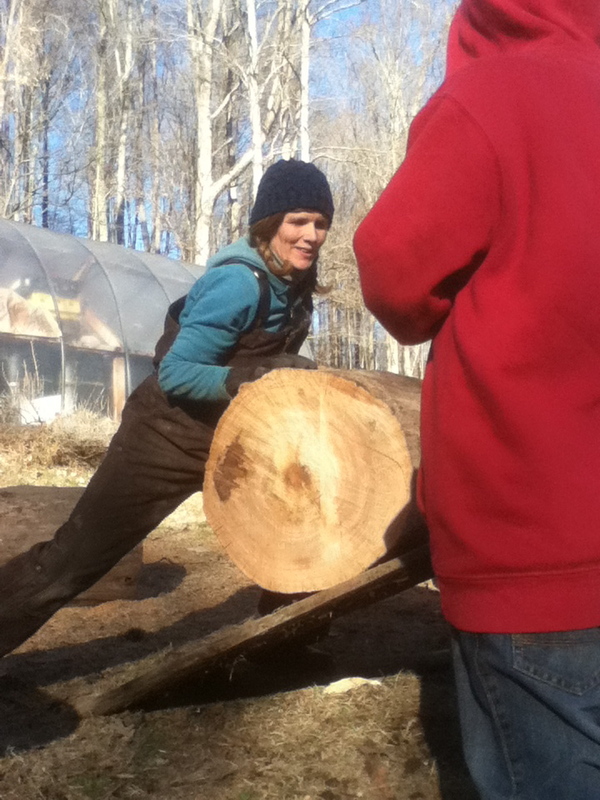 Even though most of the splitting of these big chunks of wood was done with our splitter instead of the maul, it is still a warmth-producing workout! Whew! 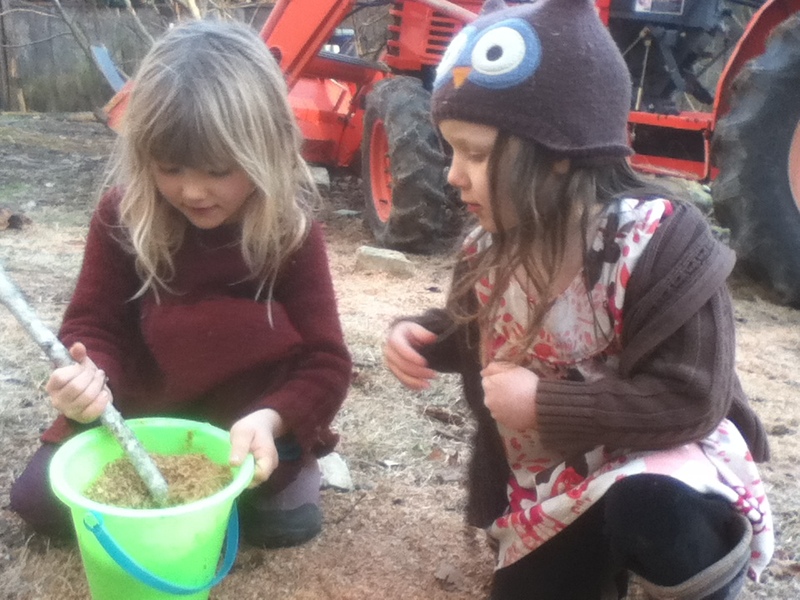 The girls found the sawdust to be a suitable ingredient for their “mixtures”. 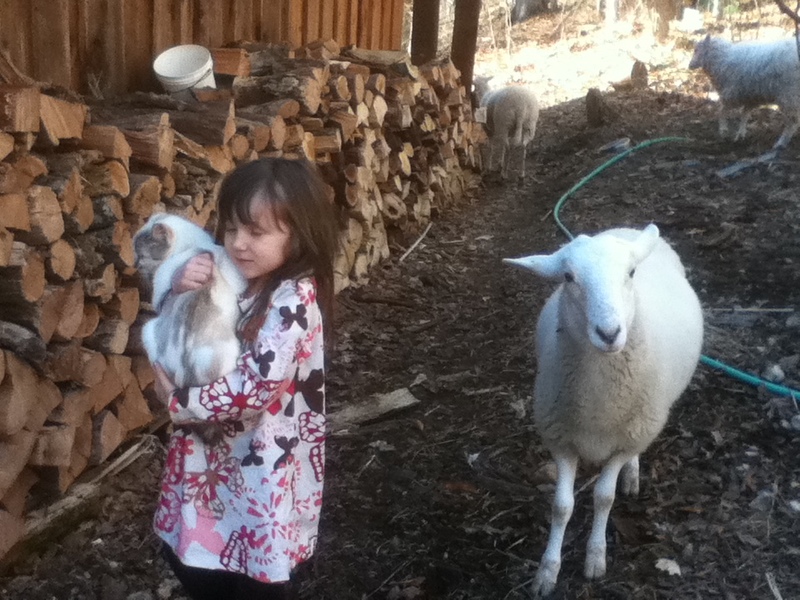 Even the “pet” sheep (the bottle lambs from the spring that just sort of hang around the homestead like pesky dogs) and the cat had to get in on the action. And now, as I sit here writing this post, I am enjoying the third phase of warmth that comes with burning wood. Ahhhhhhhh. So there’s more cold weather on the way? Bring it on… my house is warm and my heart is even warmer. 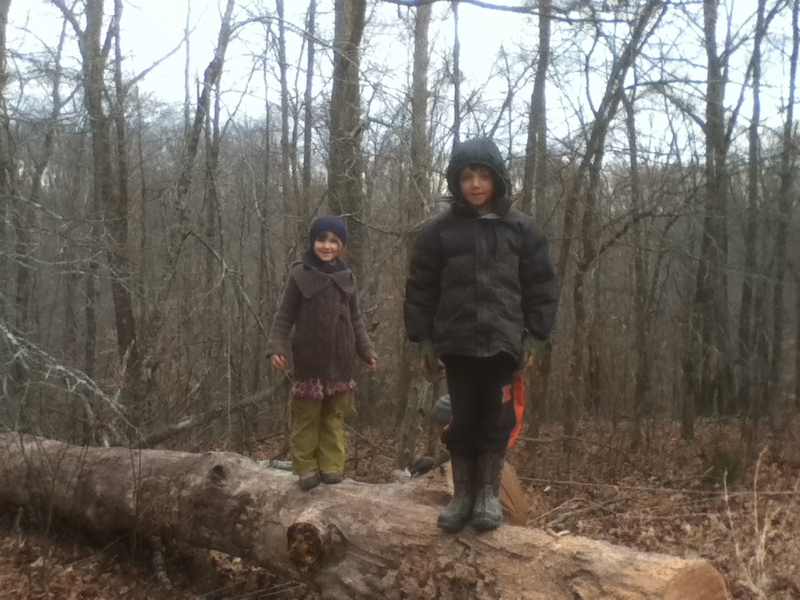 Love the look on your kids faces looking at the chainsaw. 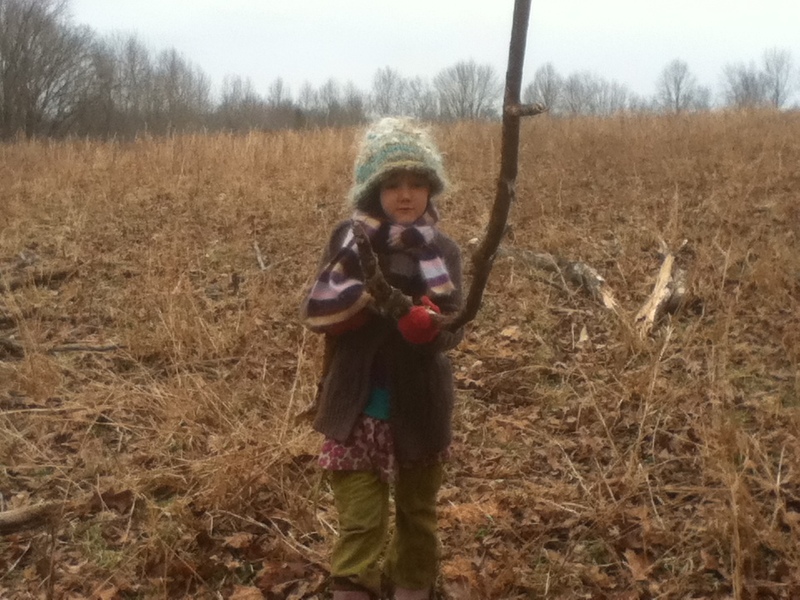 And your daughter’s wood cutting outfit is adorable! 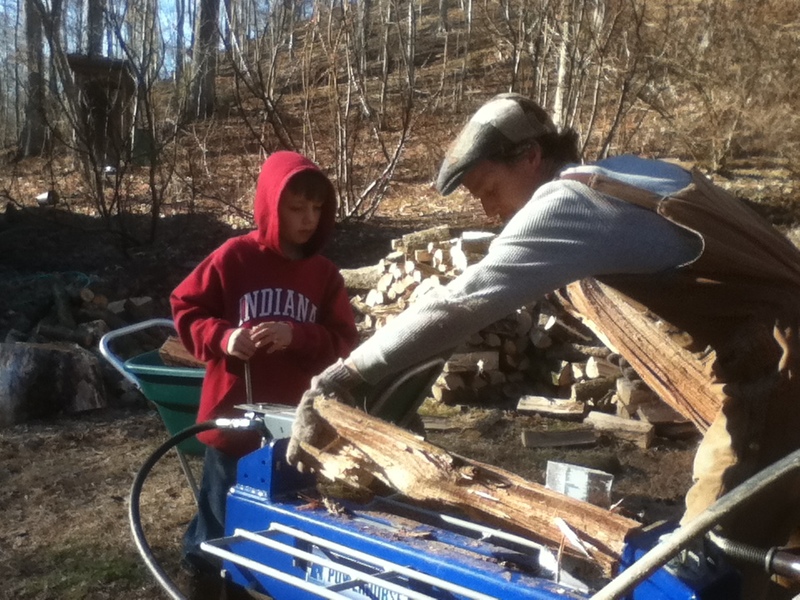 People who heat their houses with the flip of a switch couldn’t even imagine how much work goes into heating with wood – from “scratch” like you do. We “cheat” because we get a cord delivered pre-cut. Yes, Opal has her own sense of fashion that’s for sure! Love it! It reminds me of the days when I was Joe’s only “real” helper. 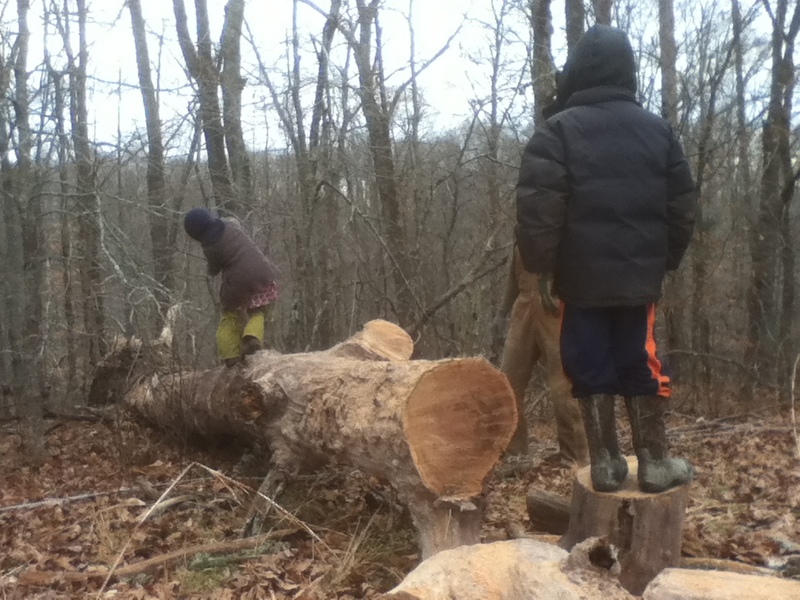 I have to admit, that although I still love to get out there and help with the bringing in of the wood, I’m awfully glad that I have two strong young men at home to hold down the bulk of the heavy work. Ha! I’m sure I will not mind it in the least when Ira’s strength surpasses my own and he can take over the heavy lifting! Yes, they are too funny! I love how your family works together, Cher, and your cat is unbelievably pretty. I always love seeing shots of it! Of course, the kids are unbelievably lovely as well! Thank you, Joy! 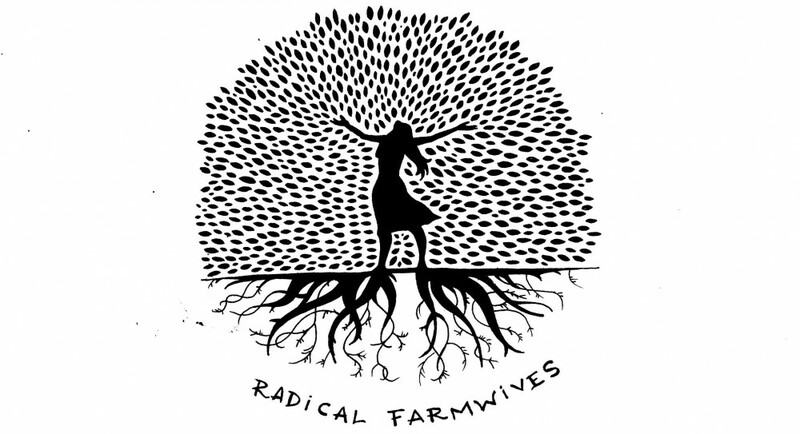 It is great when we work together AND work harmoniously… but it doesn’t always happen that way! I love that your family is all in handknits!